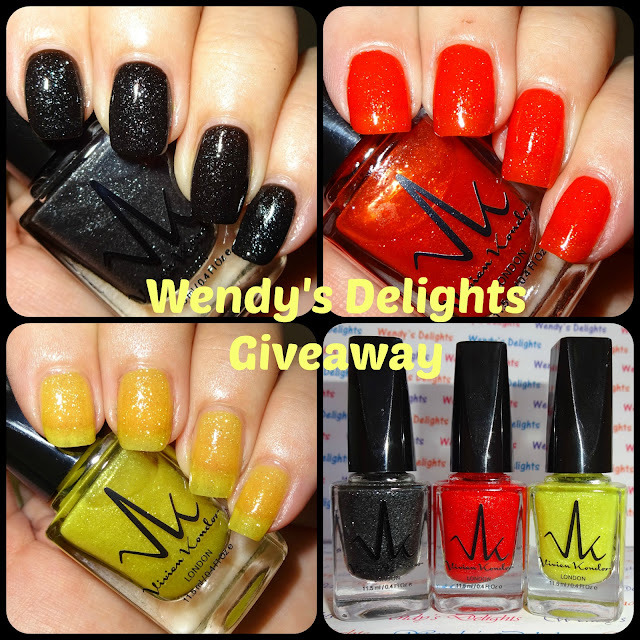 Please feel free to enter my Giveaway for a set of 3 Vivien Kondor nail polishes. I have reviewed these polishes and they have been swatched on one hand so please be aware when entering that they have been used for swatching. They are from the Bon Bon Collection which are slightly scented. All Vivien Kondor nail polishes are vegan friendly, cruelty free and 5 free. Here is 'Liquorice' a black jelly base packed with silver glitter. Liquorice dries matte and once regular top coat is applied, sparkles like mad in the sunshine! 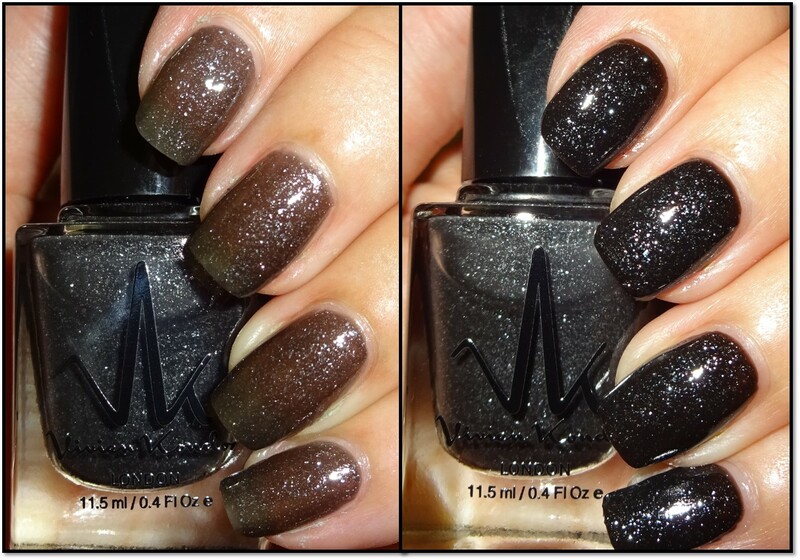 I applied 3 coats over a bare nail (pic below left) which gave a charcoal shade and 1 coat over black polish (pic below right) which reminds me of black granite. Next up is 'Strawberry' a vibrant bright orangey red packed with delicate glitter which gives the polish the wow wee factor. I applied 3 coats. And finally 'Lemon' a jelly polish packed with fine glitter. Because it's a jelly I've tried it over different coloured bases and it's AMAZING, especially over darker colours. Below left - from thumb to pinky - over a bare nail, white, yellow, red & black. Below right - over dark blue, turquoise, taupe & pink. The dark blue looks like stars twinkling in the night sky, the turquoise is changed to green and looks like a shimmering mermaids tail, the taupe has a bronze glow and the pink is turned to a sparkly coral. Here's a close up over red and black, lovely for the festive season!